Before I talk about the run I did on Sunday, I’d like to mention the run I did yesterday. I actually wrote this post last night, and at the time I typed up a little blurb about how I didn’t go running even though I had planned to and had no good reason not to. Just writing that out made me feel silly for not running and I changed and headed out the door! I did a 30 min easy run with strides. I’m not sure I actually kept it at an easy pace the whole time because I was feeling good. I ended up with 3.11 miles at an average pace of 9:39/mile, and I’m pretty glad I went. Today is National Running Day, and I’ve saved a key workout for today, so I know I’ll be out there again pretty soon. 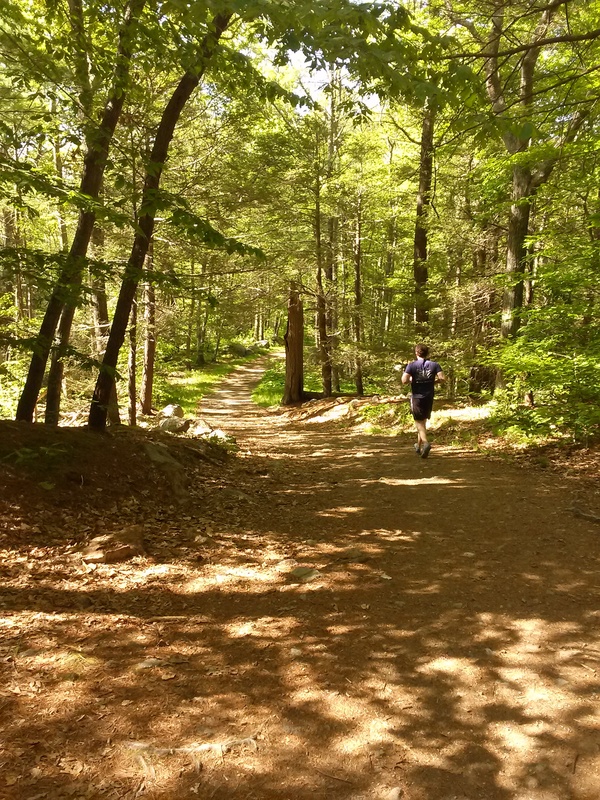 Jeff and I had so much fun on our 1st ever trail run, despite taking a few wrong turns, that we decided to give it another go this past weekend. This time we headed to Ravenswood Park. We’ve snowshoed there before and knew the park had some wider trails and was marked really well. Given how much fun we had last time, and being a little familiar with the trail, I was super excited for this run. When we got there around 8:45 AM, the (small) parking lot was already full. This was a little disappointing because one of the things I liked best from our last run was that there were so few people. Once we got going we stuck to the main (wider) trail and we saw quite a few other people compared to our previous trail adventure – a lot of them with leash-less dogs. I don’t know what the rules are for the park regarding leashes, but I do know that I don’t like running near unleashed dogs because they seem so unpredictable. Anways, leashless dogs aside, once we got going, we were by ourselves for the most part, just passing a person and/or dog every once in a while. 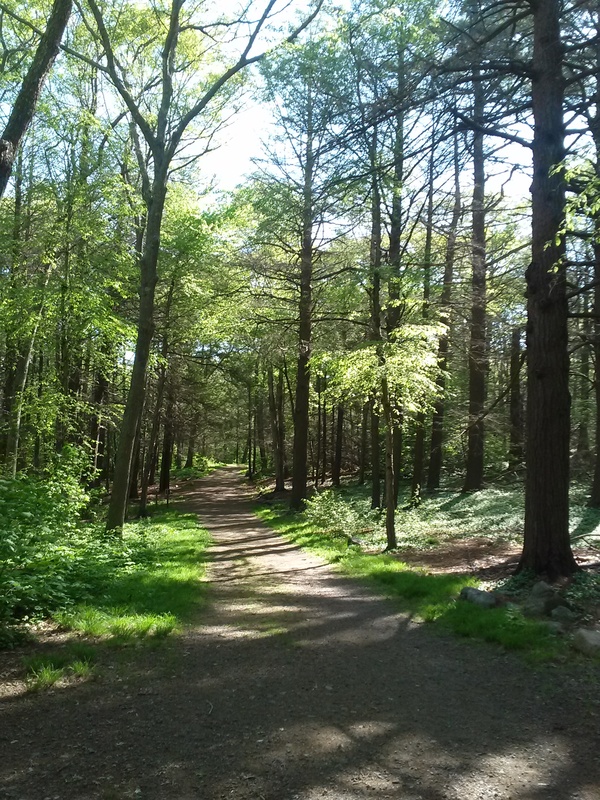 It was pretty nice running on the trail, in the shade of the trees with the sun shining through, and the weather was great for running (high 50s). From the start, we knew that this park was much smaller than Willowdale where we ran last time, and we planned out our route a little bit better than that trip as well. What we didn’t realize was that this trail was more difficult. Although the path was crushed stone, there were a fair amount of rocks poking through that made it a little uncomfortable and bumpy, and it was much hillier than Willowdale, as well. Even so, the rocks and hills weren’t what soured me on this run. About 1/3 of the way through we came to a fork where the trails got a little narrower and rockier. After climbing a particularly steep boulder we ran into another runner and chatted briefly about the trail. She commented that the trail we were on was a good one, and mentioned that it got easier and wider further on. She must have taken another route than we did because shortly after leaving her things got very nature-y. I don’t take pictures in the areas with excessive nature. That would require me to stop and stand in it longer. We hit a fork and went down what we thought was the correct path. This area was single track, and we hit two fallen trees that we had to climb over. Additionally, there were these little inch worm like things hanging from the trees – this was very disturbing to me. But, we powered on because the nice woman said the trail was going to get easier. And then, the trail ended. We turned around and headed back to the fork. More inch worm things and bugs greeted us on our way back out, and then Jeff saw a snake. I didn’t see it, but I yelped anyways. I had reached my limit, and I wanted out of the woods. When we got back to the fork, we tried to understand our mistake, and we noticed a third path that we hadn’t seen the first time around. Surely this was the correct path – so we headed down it rather than turning back – into the woods we go! A few feet later, I inhaled a bug. Seriously? GET ME OUT OF THE WOODS! But the woman said the path got wider, so we kept moving forward, because forward was going to lead us out…until we hit an impassable section of trail – at least ten feet of “deep” mud. So, we turned around again, and this time we ran back the way we came with one goal in mind – get our butts out of the woods! Jeff running out of the woods! Overall, we ran for about 50 minutes, covering what I estimate as around 4 miles. Unlike last time, I’m not super eager to head back out to the trails;I ran into one too many bugs out there on Sunday. And, I’m not sure I’d come back to run this park again. I’m much better suited to the wider trails and carriage roads, and there just weren’t enough in this park to cover a decent distance. Maybe trail running isn’t for me after all? How do you feel about bugs, dogs without leashes, and snakes? Do you think the woman we talked to was lying to us? I don’t really have a lot of trail running experience either. I’ve run on rail trails a few times, but those were all much less woodsy, and some of them paved. I might go back to trying those out again before I head back in the woods….keep nature at a safe distance. Oh, those dangling inch worm things drive me crazy! Between those, horrible random spider webs, and mosquitoes a-plenty, I feel like I’m constantly batting things away from my face when I run in the woods, and then I feel like I’m covered in crawly things later. Ew. I’m also paranoid about ticks getting stuck to my legs, even though I avoid running through leaves. I’ve been enjoying trail running for the variety, but I’m not a fan of woods bugs! I’m with you on the leash-less dogs too. You never know when one might decide to run with/at you! Even if they mean well, you never know when someone might be afraid of dogs, and it bugs me when people unleash their dogs and don’t think it’s a big deal. I got (non-viciously) attacked by leash-less huskies when I was a kid, and I’m still a little wary of running near dogs because of it. Yes, I didn’t mention ticks because I haven’t had any run-ins with them, but I am terrified of getting lyme disease. The rest of the bugs are gross and annoying, ticks are downright scary! Haha, this one made me laugh out loud and I am definitely with you on the bugs, woods, and unleashed dogs! Not cool. Yeah, I’m definitely not very nature friendly.